It's almost a pity that most cruise passengers use Sorrento as a mere transportation hub, pausing just long enough to catch a bus, train or ferry to big-name destinations like Pompeii, Capri and Naples. The clifftop town -- with its alfresco cafes, 19th-century villas-turned-hotels, warrens of old city shopping streets and coastal views -- is a picturesque place to spend a relaxing day ashore. Sorrento offers cruisers a delectable taste of Italy that will leave you hungrily anticipating later ports of call along the Italian coast or yearning to return to take a bigger bite out of the scenic Amalfi Coast. Sorrento wears its history on its sleeve -- a 10th-century church here, a 14th-century cloister there, a 15th-century loggia across the way. The area was first settled by the Greeks who called their new home "the city of Sirens" -- where in mythology, those lovely mermaids lured seamen to death with their pretty songs. In Homer's "Odyssey," Ulysses stuffed the ears of his crew with wax and bound himself to the mast so he could hear the tempting tunes as they passed by. Even so, Sorrento's alluring call enticed to its shores a number of different empires, whose wealthy saw the area as an ideal seaside playground. Roman emperors built vacation homes here, and the appeal carried into the 18th and 19th centuries when Europe's elite came here on their Grand Tours and the literati of the time wrote the praises of this seaside spot. Today, Sorrento continues to be a popular tourist destination and the perfect spot for leisurely independent exploration. From the tender piers at Marina Piccola, it's a short bus ride (or more arduous walk) up the cliffside to Piazza Tasso, the main town square. From there, you can wander through the small tourist center, pausing to admire the inlaid-wood decorations in the Duomo, spend your euros on a leather bag or lemon-flavored chocolates, or simply admire the pastel-colored villas. There's no shortage of scenic overlooks for photos of your ship or the Amalfi Coast, and weary sightseers can rest their feet and fill their bellies in any number of alfresco cafes (try a wood-oven pizza for a true taste of the Campania region). You certainly can't go wrong with day trips to Sorrento's more famous neighbors. A tour of the ruined city of Pompeii (or less famous Herculaneum) lets visitors experience how ancient Romans lived, worked and played. The Isle of Capri is a playground for the rich, but the casual tourist can enjoy dramatic views and upscale shopping from the island's picturesque towns. Cruise ships offer a variety of tours to all of these attractions, yet independent travelers should know that most day-trip destinations are easily reached on your own by Sorrento's trains and ferries. If you do head out of town, try to come back early. Sorrento's pleasures can be sampled in only an hour or two, and a stroll through the town will be a wonderful cap to your day on the Amalfi Coast. 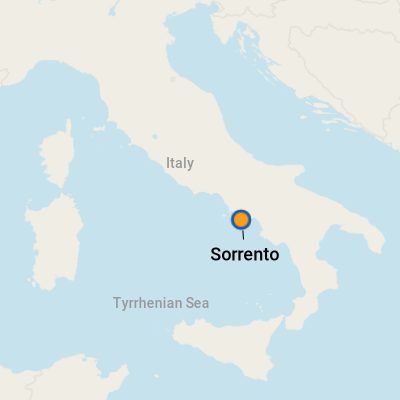 Sorrento is a tender port, and one that is easily canceled if rough seas don't permit the tenders to run. Tenders dock at Marina Piccola, which is also where the hydrofoil to Capri departs. There's no terminal or any other port facilities. Marina Piccola is located at the bottom of the cliff upon which the main town of Sorrento perches. Within steps of the tender drop off are souvenir and tobacco shops, a currency exchange office and several cafes. There are also ticket booths where you can buy ferry tickets to destinations like Capri, Naples and Positano, and a staging area to catch a bus or cab. Sorrento appears not to believe in pedestrian crossings, so take care when crossing main roads such as around Piazza Tasso. It's not always obvious where the best place to cross the street is, especially with so many cars and Vespas darting about in multiple directions. When you see a clearing, walk quickly and confidently across the road and oncoming traffic should stop. If you plan on touring the Amalfi Coast independently, pad your schedule with extra travel time, especially during the summer high season. Battling nightmarish traffic on your own could easily cause you to miss your ship. If you want to venture out of town, this is one port where shore excursions can be a lifesaver. By Foot: The walk from the marina to town takes about 20 minutes and is mostly uphill, involving some 200 steps (not recommended for the faint of leg). While the walk from Sorrento back down to Marina Piccola isn't too bad (the steps start right after the scenic overlook on Via de Maio), most people will prefer to catch a bus up from the tender pier to the main town. If you're not venturing beyond Sorrento proper, you can easily walk to all the attractions, shops and cafes of the city center. By Elevator: Follow the walkway to the right along the shore (toward the swimming concessions) a few minutes and you'll reach an elevator that takes you to the top of the cliff (1 euro one way or 1.80 euro round trip). By Bus: From Marina Piccola, the blue bus (buy tickets onboard) heads directly to Piazza Tasso, Sorrento's main square. The orange bus (buy tickets at one of the nearby shops) goes to the Circumvesuviana train station. Intercity buses to destinations along the Amalfi Coast also depart from the train station, but be warned that the roads are winding and in high season, traffic can be heavy. City Sightseeing Sorrento offers a hop-on, hop-off bus tour in the greater Sorrento area, as well as excursions to Ravello, Minori/Maiori and Positano. Buses depart from various locations, depending on the tour. You can buy tickets online, onboard or in authorized agencies, such as hotels. By Train: The Circumvesuviana Railway runs from Sorrento to Naples, with stops in Pompeii, Herculaneum and other towns. It's very easy to do independent exploration by train. Take the orange bus from the tender pier to the railway station; otherwise, it's a short walk from Piazza Tasso. Trains run about every half-hour. By Ferry: Catch a ferry or hydrofoil from Marina Piccola to Capri, Naples, Positano or other destinations. The ticket booths and the departure points are steps from the tender drop off. The hydrofoil to Capri should take about 25 minutes. By Taxi: You can hire a taxi from stands at Marina Piccola or in Piazza Tasso, if you wish to take a cab to nearby destinations or the Amalfi Coast. Be sure to agree on a price before you start driving. By Car: Various local and international car rental agencies have offices in Sorrento, such as Auto Europe, Europcar and Hertz. However, even if you're willing to brave the twisting coastal road, with summer traffic you're better off taking a ferry or train. The euro is the currency in use throughout Italy; for current currency conversion rates, visit www.oanda.com or www.xe.com. There's a currency exchange office, but no ATM, near the Marina Piccola tender pier. Once up the hill, ATMs can be found in Piazza Tasso (northeast corner of the square) and just off Piazza Sant'Antonino at the intersection with Via San Francesco. Currency exchange offices are much more prevalent than actual banks. Italian is the official language, but English is widely spoken in the tourist areas, and English-language menus are available in many cafes. Sorrento's tourist areas are chockablock with restaurants, from cafes lining the various piazzas to upscale restaurants in fancy hotels. You can't go wrong with pizza (some of the best in Italy is found in Naples and its surrounding towns) or fresh fish. Skip dessert at lunch and stop later in the afternoon for a gelato (creamy Italian ice cream) or a taste of locally made limoncello (sweet lemon liqueur) at a bar. Most restaurants will charge a coperto (cover charge) of a few euros for bread and the privilege of sitting down at a table (a la tavola); this is separate from the service charge or gratuity, which may or may not be included. If you're having a coffee (caffe) or snack and don't care about sitting down, you can skip the coperto by bellying up to the bar. In some Italian bars, you pay first at the cashier stand and then order you food and drink at the counter. On a hot day, an Aperol Spritz is a cool, refreshing and not overly alcoholic cocktail. It's a combination of bright-orange Aperol (an Italian bitter orange aperitif), prosecco and a splash of soda water, served over ice, usually in a balloon-type wineglass. Cin-cin! With lemon trees growing right in the city, products like limoncello and lemon-flavored candies and cookies are great local buys. The best areas for window-shopping are Piazza Tasso and the narrow Via San Cesareo. The streets are lined with shops selling everything from jewelry to limoncello, paintings, Murano glass, produce, ceramics and souvenirs. For a more expensive souvenir, look for inlaid wood items (jewelry boxes, picture frames, etc. ), as well as lace and embroidery. The best-known maker of inlaid furniture is Gargiulo & Jannuzzi (Piazza Tasso, 011 39 81 8781041) which opened in 1863. For a very Italian souvenir, leather bags, gloves and belts make for fashionable gifts and mementos of your trip. Glove and pocketbook shop/manufacturer Concetta Pane (14/16 Via S. Francesco, 6/8/10 Via S. Cesareo and 16/20 Via S. Cesareo; 011 39 81 877 0003) also sells belts, shoes and wallets. Keep in mind stores are open mostly 9:30 a.m. to 1 p.m., and again from 4 p.m. to 8 p.m.
And if all the retail therapy has you hungry or thirsty, just pull up a chair at one of the cafes along the way.